Magic, and tragic years, tend to fill the calendar of commemoration for central European patriots. There are religious intercessions; guiding symbols; omens. Then there are the calamities, the crushing battles that empty entire classes and countries. For Hungary, a country ever dreamy and mournful about such events, there are two notable disasters of rollicking value. There is Mohács 1526, where a good deal of the country’s aristocratic elite fell before the relentless Ottoman advance. The event effectively gave the Hapsburgs the ascendency to the west, assuming the role of defender against the Turkish advance into Europe. Then there is 1956, where the invaders assumed the form of Soviet tanks and a hundred thousand troops, precipitating the 200,000 refugees and the execution of then premier Imre Nagy two years later. The turning point came on November 1, 1956. Nagy decided that Hungary would exit the Warsaw Pact, declaring itself neutral. 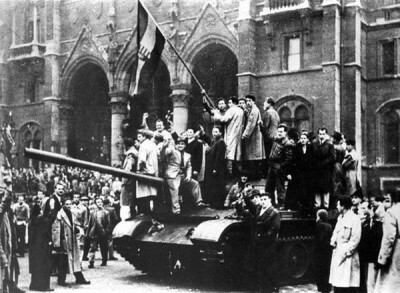 The crushing force of the subsequent Soviet invasion traumatised the communist movement in Western Europe, stripping the ranks of various party branches while hardening others who felt that ideology needed tanks to back its strictures against the waverers. Behind the Iron Curtain, it was a warning to dissidents to play it by ear – and a resolutely acute one at that. As with any such historical events, more tends to be made of less. The initial protests were hardly premised on a back breaking revolution. Inspired by anti-Soviet protests in Poland, thousands of students marched through Budapest sporting the famous “Sixteen Points” on October 23. Central to these demands was a freeing up of Hungary from its labouring satellite status, entailing the withdrawal of Soviet troops, freer foreign policy, and free elections. Then came the greater numbers, posing a direct challenge to the authority of the first secretary Ernő Gerő, the enthusiastic removal of Stalin’s statue, and fire from nerve wracked secret police. Nor was there anything systematic or steely about the organisation of the protest. Hungary’s doomed Imre Nagy was not as skilful as he might have been, despite showing courage before the proceedings arrayed against him. If history takes place on a moving train, this particular one proved wobbly and uncertain. Caught between the absolute aims of the fighters, and reassuring Moscow that their disruption might be kept minimal, Nagy failed to do both, a symptom of what Hobsbawm termed “heroic victimisation”. Much of this had to do with the fact that the Hungarian Communist Party, by that point, was in tatters. Misinformation and mishandling, in short, was everywhere. Assertions that the Soviet leadership were compulsively “trigger happy” are dismissed by Gati. There were concessions sought; there was a hope for a solution more reminiscent of Yugoslavia or Poland. But it becomes increasingly hard to avoid the sense that historical actors, once unleased, have no sense of what can happen next. Folly tends to be a default outcome. The other story was the interplay of the other side of the now thick curtain, which had only been momentarily pierced by the de-Stalinising rhetoric of Nikita Khrushchev. Many of the Hungarian students laboured under some presumption that Western intervention in some guise, marshalled with US support, would take place. Such outlets as Radio Free Europe fed the manna of presumed freedom to the “student movement”, as it was termed. This was aided by the counter-revolutionary rhetoric of rollback, encouraged by initial US Cold War administrations keen to arrest, and repel Soviet influence. Like some radical mystique, Soviet rule was meant to melt into to the background before the idea of a popular uprising. But the eyes of then US President Dwight D. Eisenhower were glued to another spectacle: that of the Anglo-French-Israeli attack on Egypt after the nationalisation of Suez by the Nasser regime. The pretext for gradualism was set, with neither superpower too eager to place the other in direct line of potential nuclear conflict. Such a train of events also supply current regimes with counterfeit political currency. Acts become unvarnished in their heroism. The government of Viktor Orbán has tended to be greedy in that regard, using historical shibboleths as readily as slogans. The chance of commemorating 1956 after six decades was always going to be impossible. “People who love their freedom,” he said on Sunday, “must save Brussels from Sovietization, from people who want to tell us who we should live with in our countries.” Russian tanks had been replaced by Muslim immigrants and Brussels. The opposition party Egyutt (Together) begged to differ, with several members attempting to interrupt this display of self-love. Hundreds of whistles and red cards were distributed to assist heckling and disruption. Orbán’s dog whistle world is set in hard blocs of culture and civilization, usually what he considers the better ones against the worst. The refugee debate in Hungary took that turn when Orbán decided that foreboding fences rather than processing centres provided better solutions. Besides, he insisted, Hungary was taking the lead again – this time against resurgent Ottomans and Islam. That’s historical Hungary for you: a self-touted figure part vanguard, and always, part heroic victim.